We here at Tycho Central are extremely pleased to announce the forthcoming CD release of "Triplex [complete]" on 22nd September 2017, via Moscow based electronic music label ScentAir Records. This 15 track CD will contain the previously digitally released Triplex Parts 1, 2 and 3, plus three additional bonus tracks unavailable anywhere else, and an 8 page booklet containing all of the song lyrics. 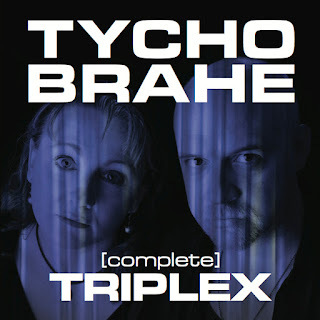 ScentAir Records is the perfect home for Tycho Brahe, being at the forefront of the independent synthpop scene in Eastern Europe, and supplying physical CDs not only to Russia, but also to the rest of the world via their distribution partners in Germany, the UK, and Argentina, as well as digitally distributing via all of the usual digital platforms. We would very much like to thank Vladimir Romanov and the team at ScentAir Records in Russia for making this CD release possible, and Stig Olsen in Denmark for once again supplying fantastic artwork. We believe that the Triplex recordings represent our most accomplished work to date, and to have this work presented as what will be our 5th full length album in physical form on CD is a dream come true.